Marble Tradition is a local manufacturer of cultured marble, cultured granite and cultured onyx in Kitchener. We are an exclusive dealer of TruStone products in Ontario. We specialize in making luxury bathroom products such as sills, bathtub surrounds, bathroom accessories, shower bases, bathroom vanities, shower glass, shower wall panels, bathroom trims and many more for your bathrooms and one of a kind spaces. We are dedicated to helping make your bathroom beautiful with the versatility of hundreds of colour and style options. 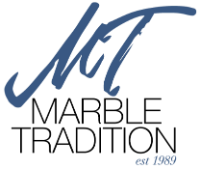 We are one hundred percent insured and warrantied, as well as offer a lifetime guarantee on all our work. Let us help you help Canada and the environment! We use Canadian made products and are an environmentally friendly company that uses recycled materials wherever possible. 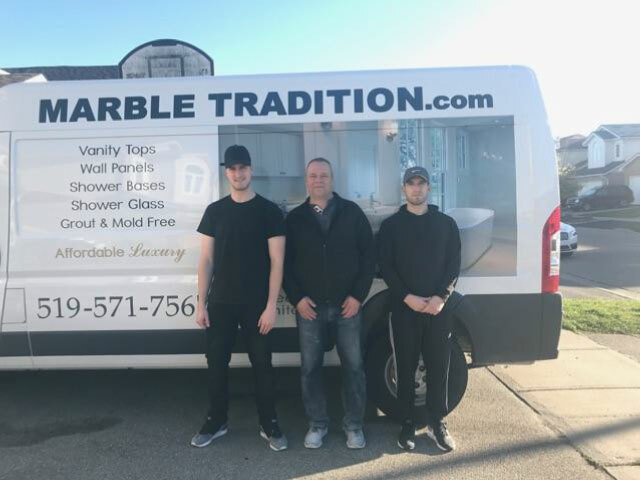 For the past twenty years, Marble Tradition has been serving Kitchener, Waterloo, Cambridge, Guelph and surrounding areas. Over the years, we have been working with a lot of renovators and installers. From helping with design decisions to manufacturing to installation. We can also work with your contractor to schedule the installation and let your renovator know how to prepare for the cultured marble installation. Contact us to request a free in-home measurement! We will tackle any custom job; you imagine it, and we’ll create it! Marble Tradition makes your bathroom renovation painless with our two day installation service. Mould, mildew, slow drains and discolouration are all common issues that affect bathrooms. 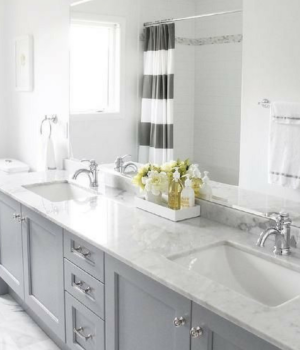 Bathroom remodelling services from Marble Tradition are more affordable than you think. A new bathtub or shower base from Marble Tradition often costs as little more than the re-glazing service that our competitors offer. When you hire our bathroom remodelling services to upgrade or update your bathroom, you can be sure that you’ll be completely satisfied with the renovation once it’s complete. If you’re looking for design ideas, view our gallery for bathroom pictures! First, we remove your existing shower or bathtub to inspect the area before preparing it for the bathroom remodel. The inspection will allow us to get a clear picture of any potential problems that might exist in the bathroom. Then, we prepare the bathroom for the fresh shower or bathtub installation by repairing any issues such as mould, mildew or improper drainage, while replacing the old drywall located behind your shower or bathtub. Then, we install your new drain, bathtub, overflow, and p-trap as well as a new drywall around the shower or bathtub. We use acrylic bathtubs or cultured marble shower bases in various sizes in each bathroom remodel. Then, the bathroom remodelling team installs your new cultured marble wall surround which is the finishing touches.